Researchers at the University of California, San Diego, have taken a huge step forward in the technology of invisibility cloaks, with a super-thin design that better hides the three-dimensionality and shadow of an object. Scientists today have unveiled the latest technology in invisibility cloaks, a super-thin sheet of metamaterials that could work better than any cloak before. This is far from the first such device; scientists have been trying to make visible things invisible for centuries. Even when such attempts are functional, the result is often, in a word, clunky. Many require enormous machinery and power sources. Others rely on the participation of all eyes involved, as in, "ok, if you stand right there... ha! I'm invisible!" To say the least, it defeats the purpose of invisibility if everyone still knows where you are. 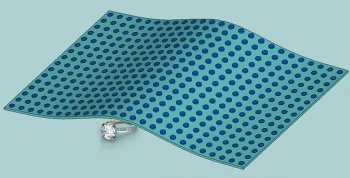 The cloak that the researchers at Univerisity of California, San Diego, have proposed is quite simple: take a three-dimensional object, such as the ring in the image above, and lay this "cloaking carpet" over it. Bending light, the cloak is able to reveal what is behind the ring, but not the object itself. What's more, even the three-dimensionality of the ring is removed - to an observer's eyes, the surface appears completely flat. This is accomplished, largely, by the adoption of two dielectric materials - a Teflon substrate, studded with cylinders of ceramic. The Teflon has a low refractive index, while the ceramic's refractive index is high, allowing the sheet to disperse the light without absorbing any. To a human eye, there is no shadow, no bump under the rug - it is invisible. Recent 'future tech' news from The Escapist. Invisibility - and the various ways of attaining it - have appeared in fiction since ancient times. The earliest known example was a ring worn by Gyges, a Greek shepherd-turned-king. Later, there was the Ring of The Hobbit and Lord of the Rings fame; various invisibility potions and injections, such as in Hollow Man and The Invisible Maniac; the Klingon Birds of Prey from Star Trek; and recently Harry Potter's cloak, which was left for him by his father. Amazingly, the researchers say that their cloak is incredibly thin - about one tenth the size of the wavelength of the photons the cloak is scattering. "One tenth of the wavelength is essentially like zero in height," acknowledges Boubacar Kante, who led the project. Though this may appear to be a literally impossible device to construct, but Kante says his team is on it - they have moved past computer models, and a physical version is well underway. Alright, Harry Potter was the obvious reference, but there are plenty more in the nerd universe. My own favorite: the episode of the X-files where a genie grants a man's wish to be invisible - and he gets hit by a truck while crossing the street.